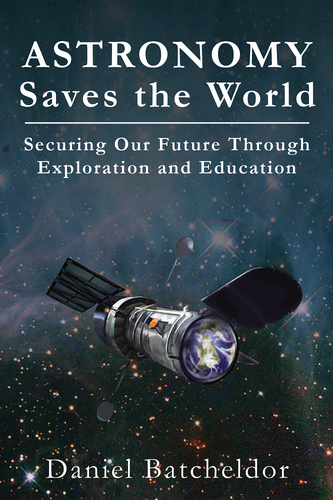 Astronomy Saves the World details the avoidable and unavoidable threats to our existence, and provides the case for astronomy being part of everyone's education. Astronomy will ensure our planet never again experiences a catastrophic cosmic impact from an asteroid or comet, and has shown that these ancient harbingers of death are now rich resources waiting to be reaped. Astronomy will lead us forward, away from an evolving sun, as we migrate throughout our solar system and beyond. But our future is hopeless without a well-informed and cohesive global society. We all need the sense of wonder and cosmic humility that astronomy instills. It is the great educational motivator regardless of demographic, and it is rich with history, science, art, engineering, music, and mathematics. It is the lesson for all humankind. Astronomy can be the key to comprehensive emancipation via education and provide us a united path into the deep future. Daniel Batcheldor grew up in the city of Bath, United Kingdom. He earned a PhD in Astrophysics from the University of Hertfordshire before moving to the United States. At Rochester Institute of Technology he taught university physics and conducted research on supermassive black holes using the Hubble Space Telescope. Since 2010 he has been on the faculty at Florida Institute of Technology where he is now Professor and Head of Physics and Space Sciences. He still conducts research on supermassive black holes, but is now involved with the space-based imaging technologies that could result in the first image of an Earth-like planet around other stars, and the issues associated with establishing a sustainable colony on Mars. Spacewalk Publishing has teamed up with Daniel Batcheldor to provide digital versions of his book Astronomy Saves The World. Your purchase includes three files. The PDF version is suitable for tablets and annotation workflows, while the mobipocket (.mobi) and epub (.epub) formats suitable for Kindles, Nooks, and other e-readers as well. In the event of device compatibility problems, please email casey@spacewalkpublishing.us to report your issue. Include the model number of the device and the firmware version number as well as which file you're attempting to read. This release is DRM-Free, and lovingly handcrafted on the Space Coast of Florida. Recorded at WFIT Studios in Melbourne, FL, with editing by Tyler Kerstetter, the audiobook release of Astronomy Saves The World is 6.5 hours in length and is narrated by the author, Dr. Daniel Batcheldor. Spacewalk Publishing brings it to you as a folder of zipped MP3 files, one per chapter plus separate tracks for the front and rear matter, playing at a sample rate of 44.1khz and a constant encoding of 128kbps. It is, as usual, DRM-free, and lovingly handcrafted on the Space Coast of Florida.